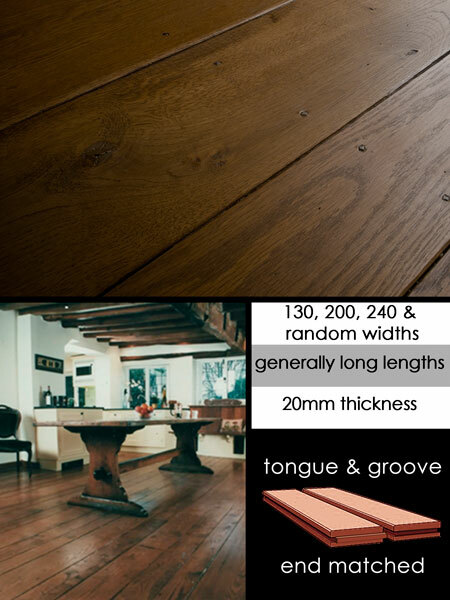 Livinghouse can supply very wide oak floorboards that are antiqued and distressed producing an old and aged looking floor. Ideally suited to older buildings and cottages, these antique looking wooden floors are a cost effective alternative to reclaimed flooring, which is extremely expensive and the quality is very often suspect. Our old looking wooden flooring is supplied with in antique dark finish which is prefinished with an old wax oil finish. The hardwood floor boards are tongue and grooved on all 4 edges for easy installation. All oak flooring is kiln dried and supplied with the majority of the floor boards long lengths. * Hand antiqued floor boards. * Authentic old looking floor. * Old wax oil finish. * Alternative to reclaimed flooring. * Prefinished for easy installation. * Most floorboards long lengths.